The versatile Exclusive Solutions collection is suitable for power showers, body jets and steam. Combining traditional styling with modern precision engineering. Watertight seals and concealed fixings with built in wall adjustment provide a luxury seamless finish with a build quality to stand the test of time. The range incorporates stunning straight and curved glass, quadrant, quintet, sliding, hinged, pivot and bi folding doors, turning problems spaces into innovative design solution. 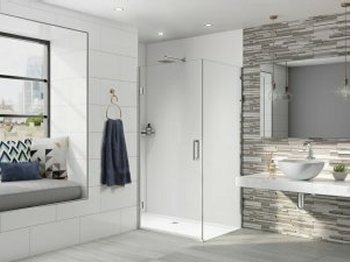 Bow top doors feature double etched glass corners for that perfect traditional look all models are suitable for both tray and wet room applications. Made 2 Measure options are also available. On display we have the Aqata DS458 hinged door and inline panel, corner option.